His Majesty's Settlement in the Bay of Honduras, as the territory was formerly styled in official documents, owes its origin, in 1638, to logwood cutters who had formerly been buccaneers. These were afterwards joined by agents of the Chartered Company which exploited the pearl fisheries of the Mosquito coast. There were frequent clashes with neighbouring Spanish settlers. The most formidable of these was made by the Spaniards in April 1754, when an expedition, consisting of I,500 men, was organized inland at the town of Peten. As it neared the coast, it was met by 250 British, and completely routed. The log-wood cutters were not again disturbed for a number of years, and their position had become so well established that, in the treaty of 1763 with Spain, Great Britain, while agreeing, to demolish "all fortifications which English subjects had erected in the Bay of Honduras, insisted on a clause in favor of the cutters of logwood, that they were not to be disturbed or molested, under any pretext whatsover, in their said places of cutting and loading logwood. Strengthened by the recognition of the crown, the British settlers made fresh encroachments on Spanish territory. The Spaniards, asserting that they were engaged in smuggling and other illicit practices, organized a large force, and on the 15th of September 1779, suddenly attacked and destroyed the establishment at Belize, taking the inhabitants prisoners to Havatia, where most of them died. The survivors were liberated in 1782, and allowed to go to Jamaica. In 1783 they returned with many new adventurers, and were soon engaged in cutting wood. On the 3rd of September in that year a new treaty was signed between Great Eritain and Spain in which ilt was expressly agreed that his Britannic Majesty's subjects should have the right of cutting, loading, and carrying away logwood in the district between two rivers. These concessions were not to be considered abrogating from the rights of sovereignty of the king of Spain over the district in question, where all the English dispersed in the Spanish territories were to concentrate themselves within eighteen months. This did not prove a satisfactory arrangement for in 1786 a new treaty was concluded, in which the king of Spain made an additional grant of territory, embracing the area between the rivers Sibun or jabon and Belize. But these extended limits were coupled with still more rigid restrictions. It is not to be supposed that a population composed of so lawless a set of men was remarkably exact in its observance of the treaty. They seem to have greatly annoyed their Spanish neighbors, who eagerly availed themselves of the breaking out of war between the two countries in 1796 to concert a formidable attack on Belize. They concentrated a force of 2000 men at Campeachy, which set sail in thirteen vessels for Belize, and arrived in 1798. The settlers, aided by the British sloop of war Merlin, had strongly fortified a small island in the harbour, called St Georges Bay. They maintained a determined resistance against the Spanish forces, which were obliged to retire to Campeachy. This was the last attempt to dislodge the British. The defeat of the Spanish attempt of 1798 permanently established British ascendency. In 1814, by a new treaty with Spain, the provisions of the earlier treaty were revived and the British did not fully claim the territory. In fact, the acts of parliament relating to Belize long refered to it as a settlement under the protection of His Majesty. After Central America had attained its independence (1819-1822) from the Spanish, Great Britain secured its position by incorporatihg the provisions of the treaty of 1786 in a new treaty with Mexico (1826), and in the drafts of treaties with New Granada (1825) and the United States of Central America (1831). 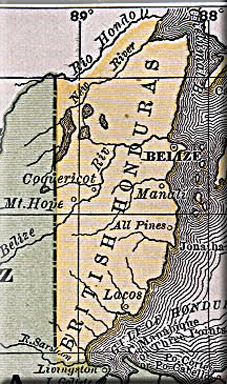 The territories between the Belize and Sarstoon rivers were claimed by the British in 1836. 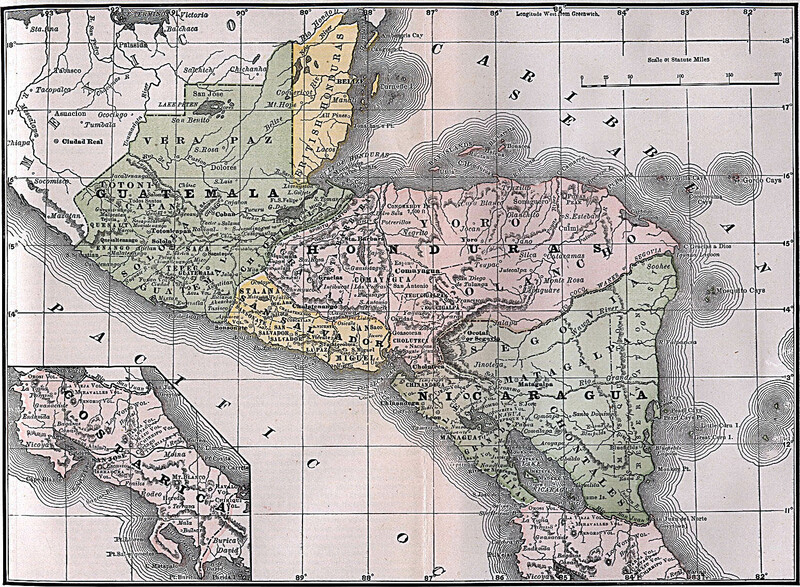 The subsequent peaceful progress of the country under British rule; the exception of Belize from that provision of the Clayton-Bulwer Treaty of 1850 which forbade Great Britain and the United States to fortify or colonize any point on the Central American mainland; and the settlement of the boundary disputes with Guatemala In 1859, finally confirmed the legal sovereignty of Great Britain over the whole colony, including the territories claimed in 1836. The Bay Islands were recognized as part of the republic of Honduras in 1859. Between 1849 when the Indians beyond the Hondo rose against their Mexican rulers, and 1901, when they were finally subjugated, rebel bands occasionally attacked the northern and northwestern borders of the colony. The last serious raid was foiled in 1872. It should be noted the number of American Confederates who settled in British Honduras from the Southern States during and after the American Civil War. They formed a significant and distinctive minority. In 1977 during negotiations for independence, Guatemala threatened to invade the colony. It was only the intervention of HMS Ark Royal and her Buccaneer aircraft that deterred Guatemala from taking the military option. In 1981 it became independent as Belize.